I don’t know about you, but when I’m on vacation, I start thinking about Shabbat on Monday. If an invitation does not surface by Wednesday, I start to worry. By Thursday, I panic. What will we eat? Will there be enough? Will the kids like it? Will I have to cook it?? Luckily, there’s no need to worry when you’re in Jerusalem. If you are staying in an apartment or house and you are not in a hotel or on someone’s meal plan, Marvad Haksamim is a great choice for affordable and delicious meals for Shabbat. The name of this restaurant and caterer means magic carpet, and looking at the vast array of food offered every Friday morning, definitely feels like a magical carpet ride. 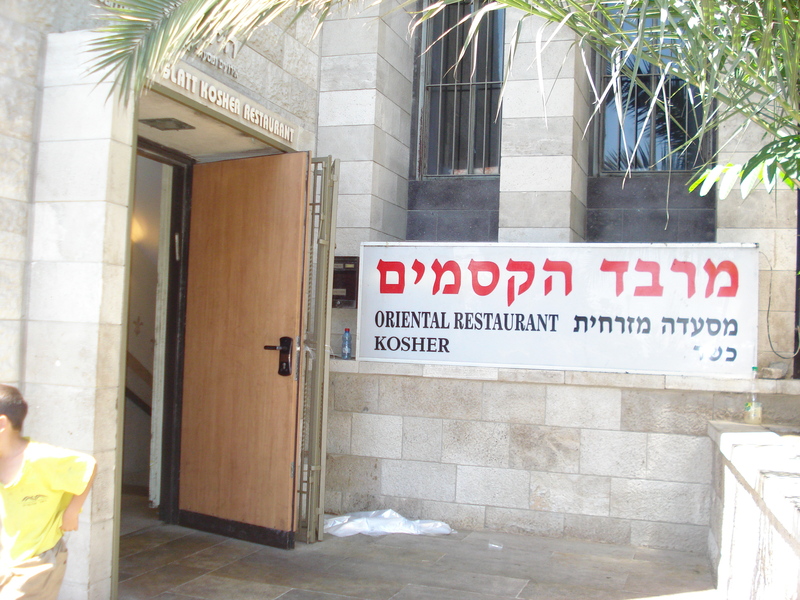 The entrance to Marvad Haksamim is located on King George St. next to the Great Synagogue on the bottom level of Hachal Shlomo just minutes away from busy Ben Yehuda. Just look for the big sign (see the picture) outside its door and follow your nose down the stairs and into the banquet hall. If you can’t spot their sign, look for throngs of people walking nearby holding nameless, light brown plastic bags – at least four to six bags per hand. You will not believe what is going on beneath your feet. Large banquet tables form an enormous U around this spacious room, and polite, helpful teenagers wait behind the tables in front of walls lined with hundreds of foil pans and lids in every shape and size. You don’t have to speak any Hebrew to navigate around this buffet, but you will need your elbows to out maneuver the people to the right and left of you. If you belong to any large synagogue, you already know how to do this. Believe me, if you can point and nod your head yes or no, the teenagers behind the tables will put your food into the foil pan of your choice and start a basket for you. Your helper will stay with you and follow you around the room filling foil pans with the most amazing Jewish delicacies. Just work your way around the room and pay the cashier who weighs your food at the final station. I was shocked at how affordable the food is, but bring cash; they don’t take credit cards. The first time I saw this Friday morning ritual, I was overwhelmed by the sheer variety of food and numbers of people. I can still hear the roar of excited liberated men and women placing their orders. Come early because Jerusalem’s best kept Friday morning secret is not so secret. Try not to go if you’re hungry because you will definitely over buy. I lost count of the varieties of rice dishes, stuffed peppers, zucchinis, onions, artichokes, and mushrooms. If they can stuff it, you can eat it. There are schnitzels, roasts, kugels, fish of every shape and color and variety, potatoes, and even a Chinese food section. If you desire Yemenite or Middle Eastern food, try their Moroccan cigars, kubeh, and pastels. There are also soups, fresh pitas, challot, juices, sodas, and refrigerated cases of desserts, chumus and tehinas. There’s even a small living room area with couches for tired shoppers to sit and take it all in. My husband loves to come with me on Friday morning to pick food for Shabbat. He will roam the tables, point out what he wants and leave the rest to me. Then he goes directly to the black couches, pours himself a cup of cola and watches the controlled chaos in amazement. After I pay, I hand him the bags and off we go. I advise bringing an extra set of hands, but you don’t need to bring a lot of money. Shabbat meals for a family of five can cost anywhere between $50 – $70 with plenty of left overs that last until mid week. Just don’t succumb to every temptation in front of you. The food is easy to reheat in your oven or on a plata, which is Hebrew for a traditional hot plate used on Shabbat. The tins are also easy to take on a picnic or to the beach or pool. 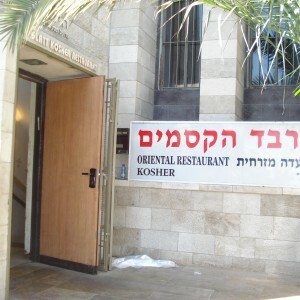 Marvad Haksamim is the place to go for consistent affordable and delicious food for Shabbat. You can also rent their space for private parties. I hope knowing this tip will take the worry out of your week. Marvad Haksamim. 42 King George St. 02-622-3312 Opens 8 a.m. – 1 p.m. every Friday morning. Middle Eastern and Yemenite food to go.